Join us for this unique summer learning experience in Cambodia designed for high school students with an interest in exploring new arenas of classical mythology and epic storytelling. In partnership with Cambodian Living Arts, our Siem Reap-based program, focuses on the Cambodian Ramayana, turning students' attention to Classics of the east. At Calder Classics we celebrate oral storytelling as universal and timeless, a tradition that spans from east to west, from ancient to modern times. Recognizing that the tales of monsters and hybrid creatures and magical transformations seem implausible and bewildering, we explore why these compelling tales have endured for so long in both the east and the west. Following Homeric tradition, our students travel far (literally and figuratively) on this life-changing journey to the land of the Khmer Empire. Along the way they read, hear, and see the epic stories of Cambodia and discover themes common to all oral narrative traditions from the Iliad to the Odyssey, from the Ramayana to the Reamker, from the lyrics of Bob Dylan to the storytelling rap songs of Kendrick Lamar. This two-week workshop is ideal for high schools students who want to engage in the study of comparative mythology. It is a perfect introduction to those unfamiliar with eastern myths and offers fresh insights to even the most experienced students of Greek and Roman mythology and epic stories. Together we discover how the stories of the ancient Greeks and Romans as well as those of the Cambodians are as relevant now as they were at the time that people first imagined them. We offer a fun way to learn about a new culture in a safe environment and to make friends who are interested in exploring new places and ideas. No Greek or Latin language skills are required but students must display a willingness to learn about the storytelling traditions of Cambodia and to think about how they compare with the classics of ancient Greece and Rome. Based at the foot of Angkor Wat in Siem Reap, students of “Classics in Cambodia” engage daily in close readings of The Reamker (known in the west as the Cambodian Ramayana) and related comparative stories. Our study of the Reamker is complemented by a daily exploration of local arts and culture, making the stories we read in the Reamker truly come to life. In the good hands of guides provided by our local partner, Cambodian Living Arts, we visit a wide range of artists in their workshops who are crafting their own versions of the Reamker including shadow puppet creators, composers, dancers and mask makers. We also visit ancient and modern sites exhibiting murals, sculptures, bas-reliefs and other forms of artistic and literary expression. Our evenings feature Cambodia’s many cultural, leisure and culinary offerings. Each day students engage in close readings and talks related to the Reamker. Discussion sessions focus on the exploration of epic themes of heroism, love and warfare common to many cultures of the ancient world. In addition to making connections to the west via Homer, we complement our study of classical eastern history, literature and culture with a brief look at the Khmer Rouge regime, uncovering how ancient themes were tragically repeated in modern Cambodian history. 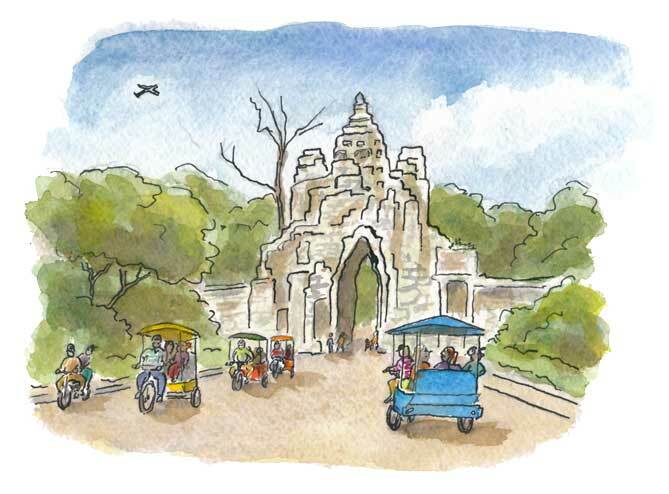 In our midst, the timeless themes of excellence and honor will be vividly present in the landscape and artistic expression of Cambodia and its people. Throughout the program, we engage with local art that is related thematically to, or directly inspired by, the Reamker and other stories we read. Guided by our local Cambodian Living Arts’ guides, whose mission is to be a catalyst in today’s vibrant Cambodian art sectors, we explore the artistic and cultural treasures of Siem Reap and the surrounding Cambodian sites, including the mural paintings of the Reamker at Wat Bo, the temples of Angkor Wat, the Bambu Stage puppet theater, Lakhon Khol mask dancing, the Center for Khmer Studies and the Center for Peace and Conflict Studies. Our visits to these treasures, institutions and performances focus on the historical context and broader themes of our program as well as their connection to the core storytelling curriculum. All of our experiences bring Cambodian classical, folk and modern stories to life. The two-week program culminates in our own storytelling composition. In a fun and collaborative environment the group will compose a “rap opera” based on the themes we explore throughout the trip. Under the guidance of an ethnomusicologist who has done extensive field work in Cambodia along with a US-based rapper we will write the lyrics, compose the music and come home with our own “epic” story to tell. WIth this culminating composition in mind, throughout the two weeks students will be given time to work on writing lyrics, composing beats, playing music with local Cambodian instruments, designing costumes, choreographing dance steps, or creating any other artistic form they choose for articulating our own epic story. There are multiple ways to collaborate and contribute to this project which may or may not include performing. Participation depends on each individual’s own inspiration. ARIZONA: Veritas Prep CONNECTICUT: Canterbury, Choate, Greenwich Academy, Hotchkiss, Milton, Taft CALIFORNIA: The Harker School, Sage Hill School CHINA: High School of RenMin University of China, Second High School Attached to Beijing Normal ILLINOIS: Saint Ignatius College Prep MARYLAND: Mt Hebron, Oldfields, Saint James School MASSACHUSETTS: Berkshire School, Clark School, Concord Academy, Deerfield, The Dexter School, The Faye School, Groton, Middlesex, Milton Academy, Newton North, Philips Andover, Tabor Academy, Winchester High MISSOURI: Liberty High School NEW HAMPSHIRE: Phillips Exeter, Saint Paul's NEW JERSEY: Dwight Englewood, Lawrenceville, Northern Valley Regional, Peddie School, Pingry, Princeton High, Stuart Country Day NEVADA: Sage Ridge School NEW YORK: Brearley, Chapin, Collegiate, Columbia Prep, Dalton, Hackley, Holy Child, Manhattan Friends, Marymount, Nichols School, Packer Collegiate, The Park School, Riverdale, Rye Country Day, Saint Ann's, St. Joseph, St. Joseph-by-the-Sea, Stuyvesant, Spence, Trinity NORTH CAROLINA: Charlotte Country Day, Ravenscroft PENNSYLVANIA: Emmaus, Germantown Friends, Westtown Friends RHODE ISLAND: Portsmouth Abbey, Providence Country Day SOUTH CAROLINA: Ashley Hall TEXAS: Saint Mark's VIRGINIA: Woodberry Forest WASHINGTON D.C.: Saint Alban's, Sidwell Friends, Woodrow Wilson... Add your school to the list! The $5,000 tuition includes accommodations, all transportation within Cambodia, museum entries, tickets to events, instruction and course materials (certain additional books need to be purchased). Breakfast, lunch and dinner are also included. Students are responsible for the cost of their own activities outside of the group. Airfare is not included. We have exclusive use of a guesthouse tranquilly located on the way to the Angkor Wat World Heritage Center and nestled in a grove of shady trees. It is a hidden gem in Siem Reap. A small hotel with only 12 rooms each with a bathtub and a balcony or garden view. The hotel is located within a few minutes walk to Angkor National Museum, Preah Enkosai Temple Pagoda, Angkor Conservation Authority and Siem Reap River, a 5-minute tuk tuk journey to the magnificent temples of Angkor Wat and a 6-minute ride away from Siem Reap city center. Rooms feature air conditioning and the hotel has Wifi and laundry service. All rooms are doubles or triples. Students may travel with our chaperone on both legs of the journey, from New York City to Siem Reap and from Siem Reap to New York City or from Florence to Siem Reap and back to New York City. Calder Classics will arrange transportation between the airport and the residence for those students who choose to travel with the chaperones.